The sports betting industry in the United States was turned upside down on Monday. The Supreme Court finally rendered their decision on a court case between the state of New Jersey and the Federal Government known as Chris Christie (now Phil Murphy) vs. NCAA. The 6-3 decision struck down the 25-year old Professional and Amateur Sports Protection Act (PASPA) that had prohibited individual states from offering legal sports within their borders. The lone exception to this law was the state of Nevada since sports betting was already legal at the time. While the scope and range of sports betting in the states that do go on to legalize sports betting in some form will change the face of the sports betting industry in the United States as a whole, rest assured that private bookies running and managing your own independent sportsbook with the help of Pay Per Head online betting software will continue to thrive. The sports betting industry in the US alone is a multi-billion dollar operation with the majority of the action going through private bookies. Your toughest competition is already well established in the form of big offshore sportsbooks operating online. If you have been able to successfully compete against them, the added competition from the few states that will have legal gambling in place by the next football season will appear to be a blip on the radar. In the first of this three-part series, the changing business environment of the US sports betting industry will be broken down into three distinct areas; timing, betting options and bookie services. For the sake of this discussion, the issue of timing will be the main focus. Monday’s decision should not come as a shock to anyone that has been closely following this situation. State’s rights should take precedent over the laws made at the federal level. It was only a matter of time before legal sports betting joined the ranks of horse betting venues, casinos and other forms of gambling that are earmarked for generating revenue for cash-strapped state governments. Just like those other forms of gambling, sports betting will be regulated, taxed and limited in scale. This alone gives the private bookie the edge you need to successfully compete in these changing times. 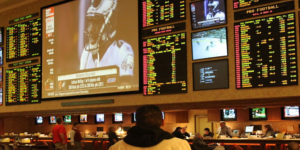 Right now, New Jersey is at the forefront of legal sports betting and this state’s race tracks and casinos could have their in-house sportsbooks up and running in a matter of weeks. Delaware already had a state lottery for a basic form of sports betting in place and Mississippi casinos have been gearing up for a favorable decision in this case for the past several months. Certain reports have mentioned that as many as 20 states have introduced legislation that could legalize sports betting in some form. That number could grow to as many as 32 states within the next five years. As a private bookie operating in any state in the US, time is still on your side as long as you are working with a quality Pay Per Head online sports betting software provider. The top PPH services in the game today offer state-of-the-art software solutions that can provide all the business tools you need to run a successful year-round bookmaking operation. They have already helped thousands of private bookies level the playing field with the big online sportsbooks and you will remain in excellent position to face any competitive challenges that may arise from legalized sports betting in the United States. Now is the time to put your sales and marketing plans in place for the upcoming football season. Avid sports bettors are more concerned with getting their NFL and NCAA football bets placed as opposed to how or where they place them. They also know that the private bookie remains the best outlet to accomplish this goal.